A photographic keepsake of life in New England. 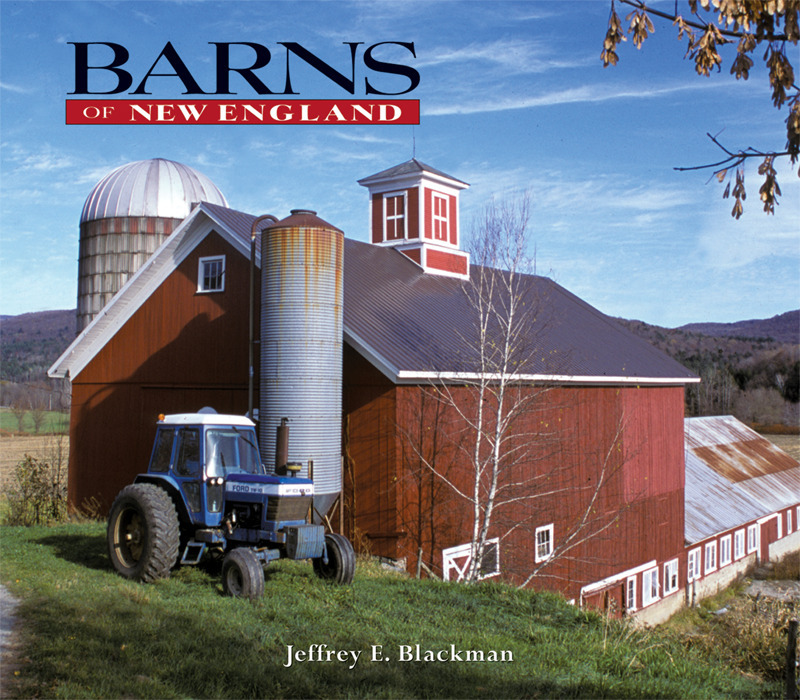 Jeffrey Blackman follows his successful Covered Bridges of New England with this companion volume that highlights the iconic barns of the same region. Rather than being postcard-perfect, these photos depict the real life of New England and its farming community with the same keen eye that informed Blackman’s photos of abandoned gas pumps and pickup trucks in Out of Gas . New England barns are icons; unlike barns of other regions, they possess a unique character and a special vernacular. Often hewn from trees cleared when the farms were first established, these barns were built to reflect and accommodate the needs of each different farm. Working farms in the sometimes harsh, always beautiful New England countryside now seem to be a vanishing species, and so the New England barn is also vanishing. If you remember what it was like to take a road trip as a child, how exciting it was to turn a corner and suddenly spy a beautiful red barn in a lush green pasture, you will appreciate this collection. It’s a bit of New England’s best to enjoy anytime, no matter where you are. Jeffrey E. Blackman’s photography has been featured in numerous high-profile publications including Life, Newsweek, National Geographic Traveler, American Preservation, and Polo Magazine, among others. He has photographed the ice festival in Sapporo, Japan; the marble quarries of Pietrasanta, Italy; Formula One in Monaco; and NASCAR races and PGA tournaments throughout the US. He is also the author of Covered Bridges of New England, Out of Gas, End Zone (an extensive photo essay about the NFL), and Barns of New England. He lives on a mountaintop near Wilmot, NH. Be the star of the cookie swap and the hero of the tree-trimming party! Flowstones are mesmerizing to look at and to hold—and they're easy to make! Corrugate 6-pack register display for Waggish (9781682680988). To be "waggish" is to be playful and mischievous—the very definition of these adorable dogs and the things they (might) think about us. You're Doing a Great Job! Experience the ancient roots and enduring natural beauty of New York as never before. Embrace the spirit of the season with the sweet scents anddecadent tastes of your favorite holiday treats. The pure joy of a dog with his nose to the horizon, in a moving car--captured on the page. When life hands you lemons… paintthem and then write down the recipes. 100 unique, hand-drawn patterns designed to relax the mind. A whole world comes to life in vibrant color and sharp detail. John Annerino, famed photographer of the Amerian Southwest, portrays the astonishing beauty of the U.S.-Mexico borderlands and contrasts those with images of the conflict that threatens to destroy them. In his latest book, John Annerino—famed photographer and writer of America's desert southwest and old Mexico—went in search of clues that would unlock the mysteries of places sacred to the native peoples of the Colorado Plateau, Great Plains, sierra Madre, and Sonoran Desert. Authoritative yet easy-to-follow advice for taking memorable photos of favorite spots on the Cape and the Islands. A stunning collection of unique photographs from America's most notorious "no-man's land." A comprehensive how-to/where-to guide to photographing more than 100 sites in the Grand Canyon. This stunning photographic journey follows the path of the Hudson River from north to south, through the Catskills and the surrounding valley region, all the way to New York City. During the nineteenth century, the Shakers conducted America's first successful experiment in utopian living. Prose and poetry from New England's literary heartland. A children’s story for the ages by a beloved artist of American life.